"I got a Keurig coffee maker, or machine, whatever you call it for $10. She (the seller) told me that she bought it about six months ago and never used it. She thought it cost about $179. I don't even drink coffee but will use it for hot chocolate and maybe try some chi tea.. My mom will like it as she loves her coffee...and one box of hot chocolate pod things for $1." Ten dollars? What's next-the lottery? If you're a coffee lover like me, you probably were overcome with a twinge of resentfulness after reading this. Crappy coffee makers are a dime a dozen at garage sales. But a brand new Keurig? That's truly a once in lifetime event! Judging from her comments, this lady doesn't seem to really appreciate how awesome her Keurig find really is. That's like winning the lottery then saying, "Yeah, but I really don't need the money!" Heck, she isn't even sure what the machine is called! The only fact she got right was the price...$179 is in the ballpark. Adding insult to injury, she claims she "may" make some tea in her Keurig! That's downright blasphemy! Sure, it makes some excellent ice tea, but it's really built to make coffee! I guess some folks just don't appreciate a good garage sale find when they luck into it. A Keurig has been sitting on our kitchen counter for a few years now. We love it. Not only does it make a fine cup of java, but the company really backs up their product. A few months ago our original Keurig began giving us a problem. It would make a crazy noise while dribbling out coffee. Mrs. Dude called the Keurig customer service hotline and the friendly representative went through the usual suggested fixes. This included cleaning out the machine by running vinegar through it. After finding none of the fixes worked, the nice customer service lady offered us a brand new Keurig unit for $80. That's roughly 50% off the retail price! (Had the unit still been under the 12 month warranty, we would have received a replacement unit for free.) The new model looks awesome with very cool blue lights illuminating the reservoir tank-a very relaxing sight first thing in the morning. As an added bonus, we have the K-cups mailed to us from Amazon. I then recycle the K-cup boxes, which are a perfect shipping size for many of my eBay items. Which brings us back to that unappreciative lady who scored a new Keuirg machine for only ten dollars. Some people have all the luck and don't even realize it! You have to watch out for used yard sale Keurigs. From what I've seen, many are missing the piercing K-cup holder yet people try to sell them anyway. They're missing because Keurig makes you send them that part if they're replacing your coffeemaker under warranty, to disable the old one and render it useless. You make an excellent point-have to watch for people sticking you with those useless Keurig. That would be a dirty trick on their part, but it happens! I heard about those coffee snobs-Ha! I set mine to "cup" size and it packs plenty of caffeine punch for me! I found a used Flavia Fusion at GW in the box for $30 and flipped it on Amazon for $90. I found a used Tassimo in the box at GW for $10, its sitting on the kitchen counter. My wife loves it. It reads the barcodes on the pods to make the perfect drink. After reading your comment I checked the Flavia Fusion machines. Wow!...the drip tray alone can sell for over ten bucks! A whole unit can go $35 to $80 from what I see-nice! Have to put that and the Tassimo on my watch list. Thanks for putting us in the know on these java machines....Dude! I found one at a yardsale and she was selling it for $10 as well. I though there must be something wrong with it. I saw it still had the piercing k-cup and she plugged it in to see it turned all and all seemed fine so I grabbed it and drove away thinking I had majorly scored. Get it home, plug it in, and the water won't filter through it properly. So on a whim I called customer service to see if they could help me out. We went through all the usual suspect problems then she blew me away and said they will send me a BRAND NEW one! I was amazed. She had all the facts in that I did indeed buy it used at a yardsale but she looked up the registration number and it was still under warrenty. Sure enough 1 week later there was a brand new updated Keurig B-70 on my doorstep. Even before I could get the piercing k-cup in the mail. tallymomma-Wow! What a great story! Don't you love a quality company that backs up their products-no questions asked! That seller probably thought it was just another lame coffee maker and didn't even think to call the company like you did! Kinda makes me want to buy any used Keurig machine I find, hoping it's still under warranty. Nice score-thanks for sharing your story....Dude! Now I am agitated with myself! Mydaughter ha a Keurig she purchased that stopped working properly. About this time my Dad had one he didnt use, in box, so we took it and she uses it now....BUT I threw away the non working unit.....AGGGHHH!! I feel your pain! Oh well, live and learn, right? At least you know to make that phone call if your Dad's machine starts to give you problems. My husband would love one of these units. Being on the thrifty side, I just can't pay retail. Will keep my eyes opened at GW. Thanks for the tip on the piercing kcup. I have heard from other people that they also were in the warranty period and got brand new units. I got a nice used one at a yard sale for $20 and it works great - I already had one so I gave it to my Mom and she loves it! I am not a coffe drinker. My husband is not one either. We have no coffee and no coffee maker in this house. But lots of Cola and Diet Cola! ha! I think I might have seen one of these machines a few times, but never knew they were worth anything. What does the piercing K-cup holder look like? That way I know what to look for when I do see one at a g sale. GSA- The piercing thing is positioned just above where you place the k-cup. 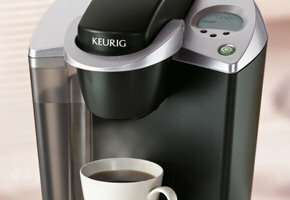 So I would imagine you can open up the brewer (underneath where it says Keurig)and feel around for the pointy thing. Cola can be a worthy substitute for coffee, but nothing beats the bean-Ha! I have scored 2 Keurigs at Goodwill auctions. Both under $40 each. Kept one for myself and gave the other to my daughter. Best money I ever spent! I love my Keurig! TX-That's awesome. I've never seen a Keurig at Goodwill. Probably because it would get snapped up as soon as it was put out on the sales floor. Timing is everything! Nice find, thanks for writing in....Dude! kdelrosario-Great point. Keurig users really have to have those to keep all those little K-cups organized. It's om my "buy" list now....Thanks for mentioning it....Dude! I got one at the Goodwill too - never used in the box for $29.99. I was going to buy one for the full price and was all too excited to find the one at the Goodwill. I thought there must be something wrong with it, but 1.5 years later it is still awesome. I thought that was amazing until another lady told me she got one at a yard sale for $5! Ashley-That's fantastic! Makes you wonder who are these people donating new Keurigs to GW?! Great find...Thanks for writng in....Dude! I went to a garage sale one day and they had about three giant coffee making machines--all pretty fancy looking and with big price tags of around $100 or more. I asked why they had so many. Turns out they had owned a small coffe down on the square in our little town. I kept walking around and saw a Tassimo. Looked like everything was there (I had checked one out at retailer a few months before) I asked if it worked and how much. Yep and $10. SOLD! We use it nearly every day. gotta love garage sales. $10? Wow-Wee! It's garage sale finds like that gets us going every Saturday morning...Thanks for sharing your find...Dude! I was in a thrift store the other day and found a Flavia Fusion. It was missing the drip tray and the lid for the water resivoir. BUT, since neither part is necessary for operation and the lights came on when I plugged it in, I thought what the heck and I bought it. SCORE for $2.05 including tax! It works perfectly! Now the decision to keep it or sell it! Nice score for sure! Here's a suggestion-call or e-mail the manufacturer. Tell them you're missing the parts or that they were damaged somehow. I wouldn't be surprised it they sent you the replacement parts for free. I did that with a Tide clock recently.They mailed me the part and now I have the clock listed on Craigslist for $50. If you do that, let me know how it turns out. Thanks for writing in....Dude! I have a Keurig. Got it as a gift for Christmas over a year ago. I just drink so much coffee as a mom of three young kids and I don't care for the results as they're a little too strong for my taste. The reusable cups are ok, but I just like my small mr. Coffee better.... To each his own, but I would recommend that if you do use Keurig machines, please consider the reusable filters. They significantly reduce your eco footprint. I hear you. Since writing this, I still use the Keurig, but recently my son has introduced me to the coffee press. I have to say, the coffee tates better and more of an oomph to it, which is nice in the morning. I think they bio-degradable K-cups should be mandatory actually. Would not be surprised if that happens one of these days.